I have vague memories of visiting Newcastle Castle as a child on a school trip - in fact it is the only memory I have of visiting a castle when I was young. I have wanted to take my own children for a while however it has been closed for the past two years as part of it's refurbishment. After our visit last week, I can definitely say this refurbishment was worth the wait and Newcastle Castle is now definitely one of the best attractions our city has to offer. The Castle is open daily from 10am-5pm and entry for a family of 4 is £15.90 (under 5's are free). You need to buy your tickets from reception at The Black Gate (location and directions here) and then walk under the railway arches to The Castle Keep. After collecting our tickets from The Black Gate we headed straight up to the third floor before visiting The Castle Keep. The third floor of The Black Gate features an interesting exhibition detailing the history of the Castle and past inhabitants. You can even sit around a table and imagine you are sitting in a Castle Garth pub of yesteryear as The Blaydon Races plays in the background. Be prepared for A LOT of stairs - we climbed the few at the entrance and were greeted with another exhibition which told the story of the Castle's medieval and turbulent past. There are hands on exhibits including armour, battle plans, weapons and living quarters. We all enjoyed looking around and imagining what the Castle would have been like in times gone by. It was now time to prepare ourselves for the 99 steps to the top! Luckily for us, you don't have to climb these steps all in one go - there are rooms to explore as you venture upstairs. Our unadventurous four year old just about managed the climb but he did need to be closely watched whereas our 5 year old and 8 year old managed it without any problems. You definitely wouldn't be able to take a pushchair upstairs so make sure you are prepared with a baby carrier if needed. One of the random parts of our trip that our children enjoyed was looking out of the windows and from the roof at the trains going in and out of Newcastle's Central station. If your children are train mad they will love this Castle as there are plenty of opportunities to watch trains go whizzing past. There is also the chance to look down this well which is probably the deepest well I have ever seen! (It is protected with reinforced plastic so very safe). As you wonder around the Castle you will see various tales of it's past - I can't believe this Graffiti dates back to the 1644 Civil war! My favourite room was most definitely the Great Hall - they have used very clever lighting and audiovisual displays to really bring this room to life. As you sit on the wooden benches it is very easy to take in the atmosphere and imagine the hall as it once was. After the Great Hall there is nothing left to do but climb the remaining steps to the very top of the Castle. 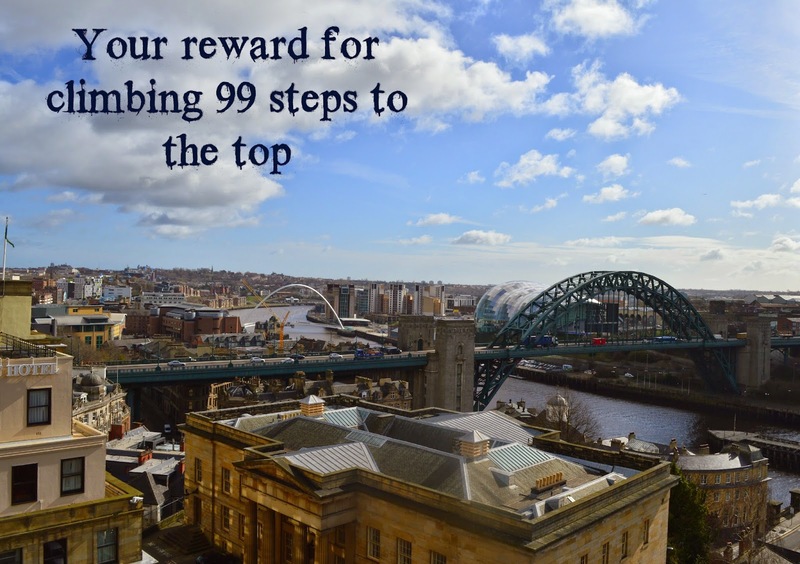 Your reward is spectacular and unrivalled views across Newcastle and beyond! We tried (and failed) to take a selfie of us all at the top. 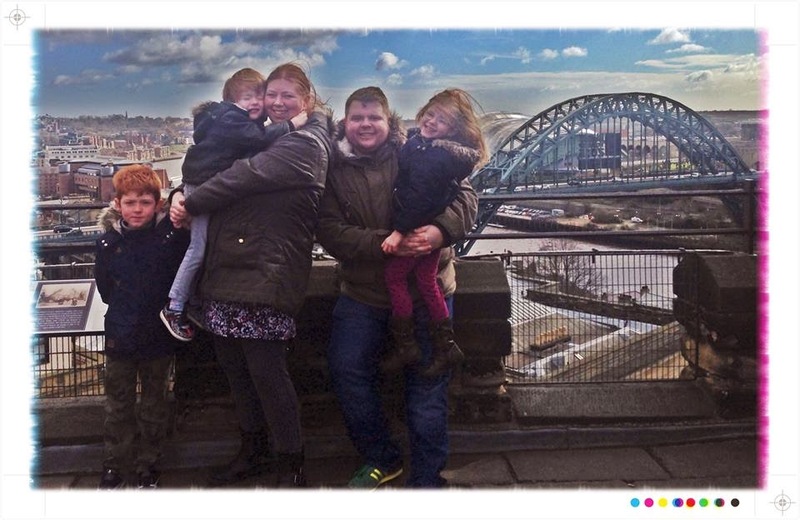 I think Newcastle Castle are missing a trick here and should employ a photographer to take family photographs on the roof. Luckily, a kind stranger stepped in and offered to take a photograph for us. It's not often we feature in a photograph together and I am very pleased with the result so thank you! The views from the top really are spectacular - despite the wind we spent quite a while up there looking at the various bridges over the Tyne, at Newcastle Central station and the streets below. It is nice and safe with security railings everywhere (although obviously still do supervise your children). We did plan to head down to the dungeons and basement but our four year old was getting very tired and whingey at this point so we decided to save that for another day. I don't mind though as Newcastle Castle is somewhere I definitely want to visit again soon. 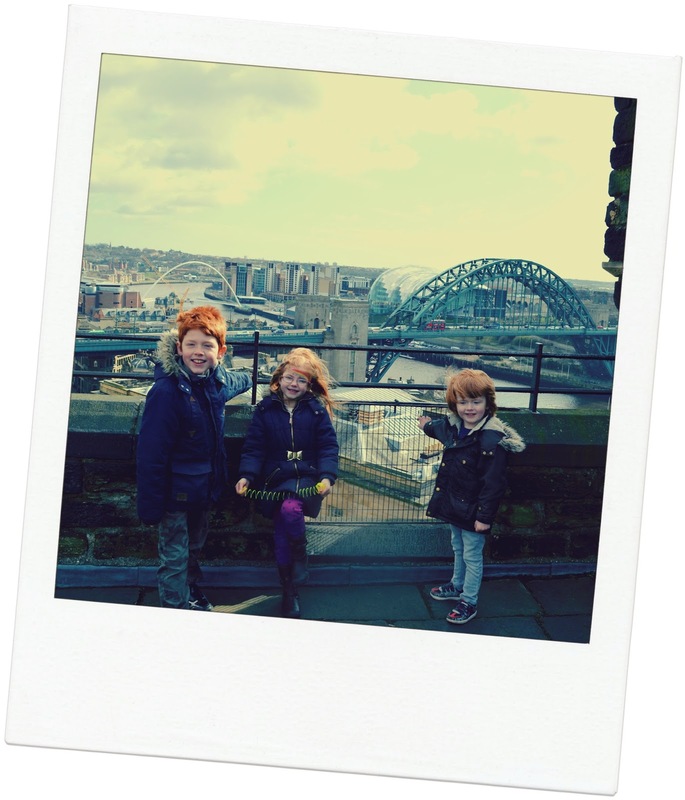 You can read about trips to Newcastle Castle with a toddler from Mumsdays and as an adult from This Could Lead to Anywhere. 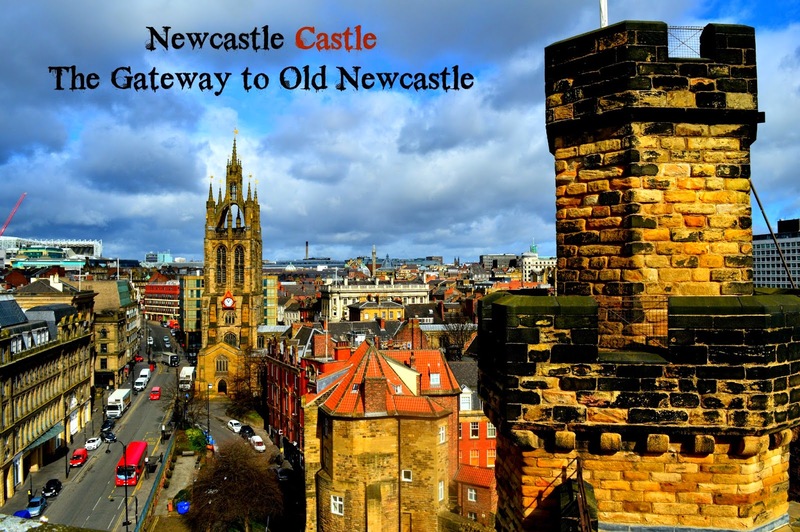 I really would recommend a trip to Newcastle Castle - there is something for all ages and it really is a place you can learn so much about the history of the city. I would pay the entrance fee again just for the view from the top! Going to the castle was one of the first things I did when I was visiting Newcastle so I'm very happy it's reopened! I can't wait to climb back up to the top for that beautiful view! The castle looks like it was a great adventure for the whole family, it must've brought back some great memories from when you were younger too. I was starting to worry you'd forgotten to add in some outdoor fun but it looks like the rooftop scenery was worth the wait, there's some magnificent views! Thanks for linking up with Country Kids. When I was growing up my dad used to be in charge of putting the flag up on the castle keep so I would get to go in early on Sunday mornings when there was no one there, I've always loved it and it looks even better now so I think I shall have to have a day out there. I love visiting castles. This one in Newcastle looks great fun and not too expensive. Absolutely love castles - I wish this had been open when we were in Newcastle a few years ago. I've heard great things about it in the past few weeks and think the kids would really enjoy it too.